The plantar fascia is a thickened fibrous aponeurosis that originates from the medial tubercle of the calcaneus and runs forward to form the longitudinal foot arch. The function of the plantar fascia is to provide static support of the longitudinal arch and dynamic shock absorption. Individuals with pes planus (low arches or flat feet) or pes cavus (high arches) are at increased risk for developing plantar fasciitis. Talk to your doctor about the best treatment plan for you. Options include. Apply ice or a cold pack to the heel and arch for 15 to 20 minutes several times a day. Wrap the ice or cold pack in a towel. Do not apply the ice directly to your skin. A special splint that will hold your foot in a neutral position while sleeping. Special shoe inserts that support the mid-arch region of your foot. Inserts that are not customized may work just as well as those that are customized. Activity. Avoid running and other activities that may worsen pain. Begin stretching exercises to lengthen the Achilles tendon and plantar fascia as recommended by your doctor. This is usually done when pain has lessened or improved. To help manage pain, your doctor may recommend over-the-counter nonsteroidal anti-inflammatory medication (NSAIDs), such as ibuprofen or naproxen. Prescription pain relievers may also be required. Steroid injections may be used in some cases or if other treatment is not working. A special type of sound wave called extracorporeal shock wave may also be considered in certain cases. This treatment happens under the care of your doctor. At this time, this is generally a treatment for long-term cases that do not respond to other treatments. Massage therapy or accupuncture may also be effective for long-term cases. In a few cases, basic treatments don’t help. Surgery may be performed to cut the tight, swollen fascia. Your doctor will determine what treatment is best for your condition. 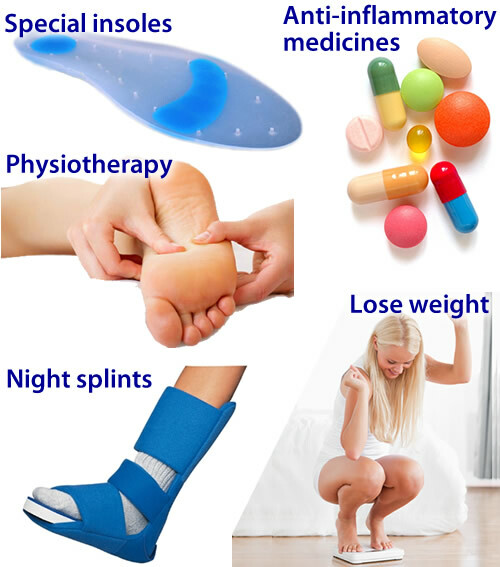 The most common treatments for plantar fasciitis include icing the affected area, inserting custom-made orthotics into your shoes, massaging the plantar fascia, nonsteroidal anti-inflammatory drugs (NSAIDs), steroid injections, strengthening the foot, wearing a night splint, wearing shoes with arch support, physical therapy, stretching the calf muscles, shockwave therapy or radiotherapy. To keep the plantar fascia lengthened as you sleep, your doctor may ask you to wear night splints. In the morning, taking your first steps is less painful because the plantar fascia remains stretched throughout the night. Avoiding activities such as walking or running helps the healing process. Losing weight, if it is a factor in the condition, may help to reduce the stress placed on the plantar fascia. Plantar fasciitis is usually not the result of a single event but more commonly the result of a history of repetitive micro trauma combined with a biomechanical deficiency of the foot. Arthritic changes and metabolic factors may also playa part in this injury but are unlikely in a young athletic population. The final cause of plantar fasciitis is “training errors.” In all likelihood the injury is the result of a combination of biomechanical deficiencies and training errors. Training errors are responsible for up to 60% of all athletic injuries (Ambrosius 1992). The most frequent training error seen with plantar fasciitis is a rapid increase in volume (miles or time run) or intensity (pace and/or decreased recovery). Training on improper surfaces, a highly crowned road, excessive track work in spiked shoes, plyometrics on hard runways or steep hill running, can compromise the plantar fascia past elastic limits. A final training error seen in athletics is with a rapid return to some preconceived fitness level. Remembering what one did “last season” while forgetting the necessity of preparatory work is part of the recipe for injury. Metabolic and arthritic changes are a less likely cause of plantar fasciitis among athletes. Bilateral foot pain may indicate a metabolic or systemic problem. The definitive diagnosis in this case is done by a professional with blood tests and possibly x-rays. Surgery for plantar fasciitis can be very successful in the right patients. While there are potential complications, about 70-80% of patients will find relief after plantar fascia release surgery. This may not be perfect, but if plantar fasciitis has been slowing you down for a year or more, it may well be worth these potential risks of surgery. New surgical techniques allow surgery to release the plantar fascia to be performed through small incisions using a tiny camera to locate and cut the plantar fascia. This procedure is called an endoscopic plantar fascia release. Some surgeons are concerned that the endoscopic plantar fascia release procedure increases the risk of damage to the small nerves of the foot. While there is no definitive answer that this endoscopic plantar fascia release is better or worse than a traditional plantar fascia release, most surgeons still prefer the traditional approach. Plantar fasciitis is a painful inflammatory process of the plantar fascia, a thick fibrous band of connective tissue originating on the bottom surface of the calcaneus (heel bone) and extending along the sole of the foot towards the five toes. Pain in the arch or heel often indicates inflammation of the long band of tissue under the foot (the plantar fascia). It can cause sharp pain and discomfort in either the mid arch region or at the inside heel, and less commonly the outside heel. It frequently causes pain upon rising from rest (especially first thing in the morning) and can progress to agony by the end of the day. Although plantar fasciitis is the most common cause of this pain, it must be skilfully differentially diagnosed from other conditions via a thorough history taking and physical examination. Treatment for plantar fasciitis includes medication, physical therapy, shock wave therapy, or surgery. Nonsteroidal anti-inflammatory drugs (NSAIDs) such as ibuprofen and naproxen are used to treat the inflammation and pain of plantar fasciitis, but they won’t cure the condition. Corticosteroids can also be used to ease pain and reduce inflammation. Corticosteroids are applied either as a topical solution in conjunction with a non-painful electric current or through injections to the affected area.